Embedded Micro has started a kickstarter campaign to fund an FPGA board called “the Mojo”, “designed to be user friendly and a great introduction into digital design”. 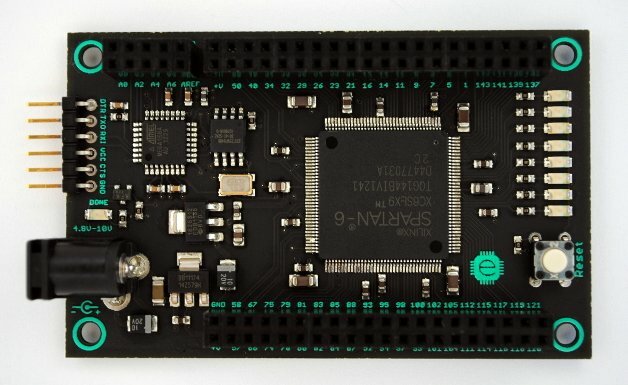 The board is powered by a Xilinx Spartan 6 FPGA that comes with over 9,000 logic cells, and will allow you to design digital circuits composed of a bunch of logic and, or, nor, etc… gates connected together to perform a specific task. Justin Rajewski, who is behind the project, uploaded a video of an example project (8×16 RGB display GPS Clock / Audio visualizer) to show what can be done with this board. Once the visualizer starts it last for the remaining 3 minutes of the video so you may want to cut it short. Since many people may not be familiar with HDL (Hardware Description Languages) used to “program” FPGA, Embedded Micro posted some tutorials to get started with Xilinx ISE. The Mojo development environment will be supported on Windows and Linux. The company already released schematics and PCB layout in PDF format. There are several pledges available, but the most popular is the $65 pledge for an assembled (and tested) Mojo board, followed by the $75 pledge to add a power supply. Shipping is included for US resident, but you need to add $5 for international shipping. This is not a good deal, take a look at the DE0-Nano, it’s got 22K cells, for abut $25.00 more. And the DE0-Nano has 32MB of 16bit RAM, didn’t see RAM on this design. Have a look at the MicroNova Mercury board. Comes in a super small DIP format – breadboard friendly. Its got a Spartan 3A 200 gates (~5000LE I think), On-board 8 channel ADC, 4 Mb SRAM, SPI Flash, USB, 50 MHz clock, and 5V tolerant I/O.